How indeed, to get lots of repetitions without it getting old? STATIONS. Here’s what I put together to practice basic beginning-of-Spanish-1 questions, numbers and letters, as well as letting them explore the language a little bit. 1. 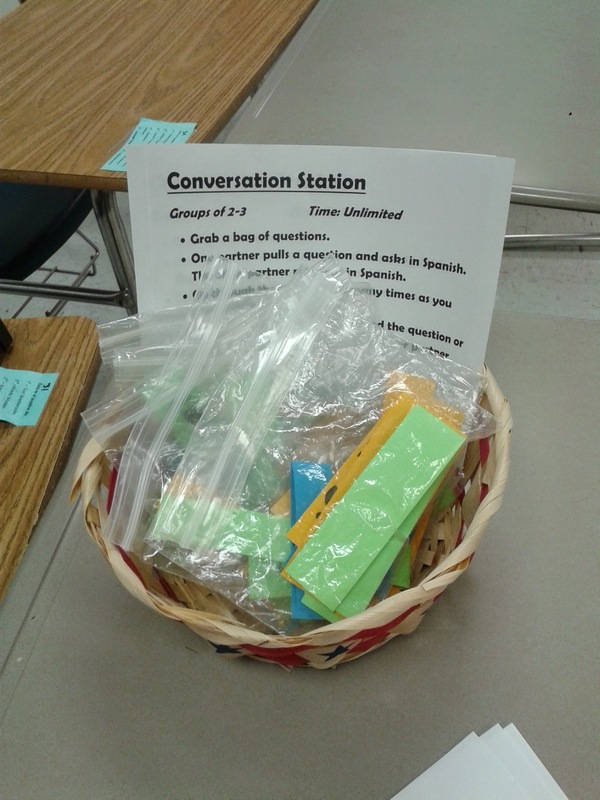 Conversation station: practice asking and answering questions out loud with a partner. 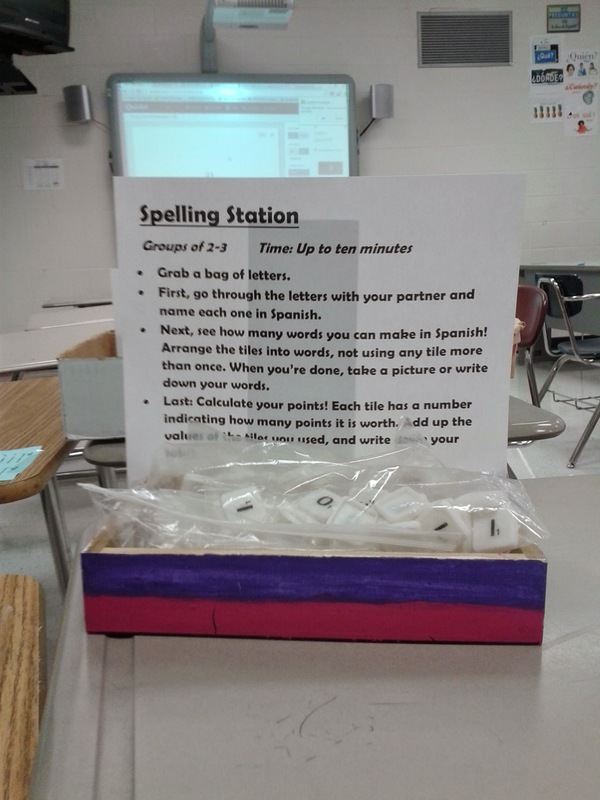 My classes are around 32 students each, so I make multiple sets of station supplies to give students the maximum number of options in choosing a station – I don’t want “but there’s nothing left to do!” or, “all the stations I need are taken!” to ever be an excuse. I printed the questions out on cardstock, and plan to save and add to these bags throughout the year. This station WILL be recycled! 2 . Numbers station: I bought these knock-off Jenga blocks from the Dollar General for $3 a few years ago. I wrote the numbers on them in a sharpie, from 1-42. Lots of teachers give students a task to correspond to a specific number, but today I just asked them to put the blocks in order. 3. 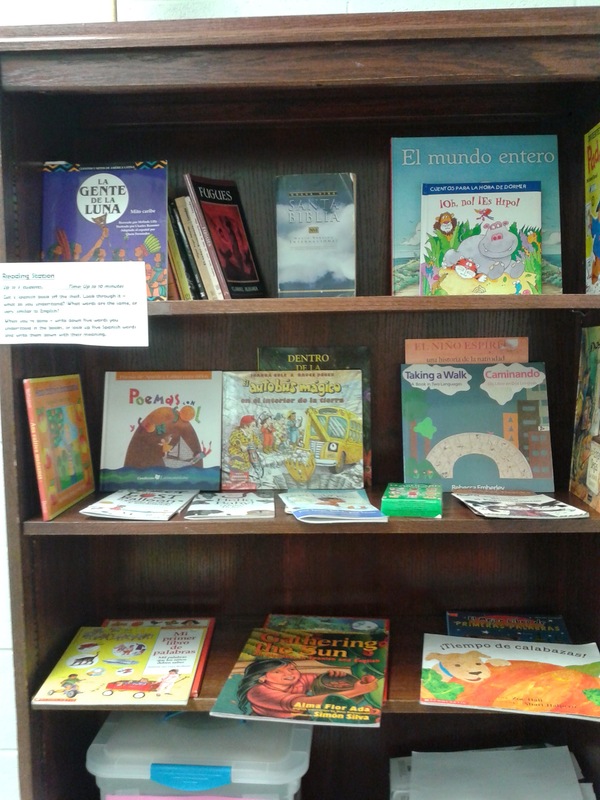 Reading station: I’ve been acquiring Spanish children’s books slowly over the past few years. I have pure Spanish children’s books, an Autobus Mágico, some bilingual books (some collected for me by my friend’s mom from Cheerio boxes), plus some “First 100 words in Spanish” type picture-dictionary books. I also have some novels, some poetry, a Bible, and a set of picture flashcards. This station was just for students to explore Spanish independently, from a book that looked interesting to them. For accountability, I asked them to write down five words they learned – either from looking at the English translation, looking at the picture, looking them up in a dictionary, or by recognizing a cognate. 4. 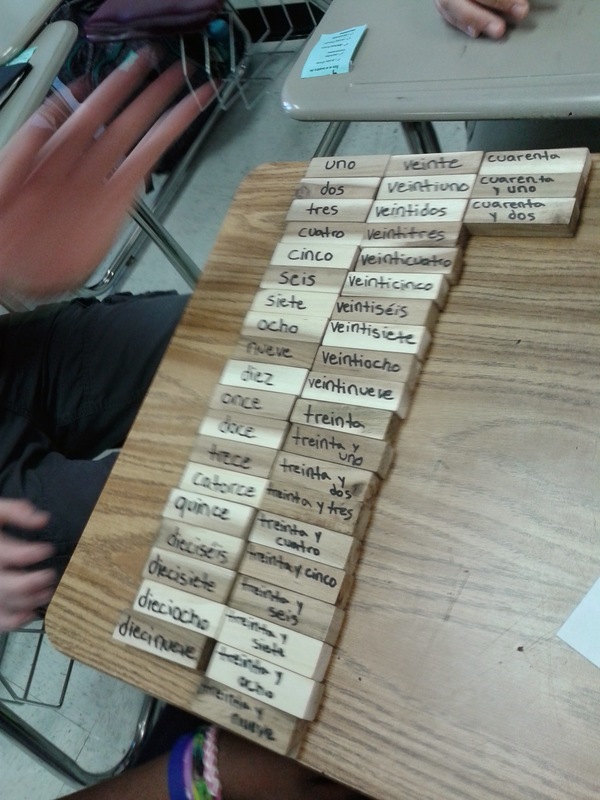 Spelling station: a good friend of mine gave me a Spanish Scrabble game (Pensante!) a few years ago. 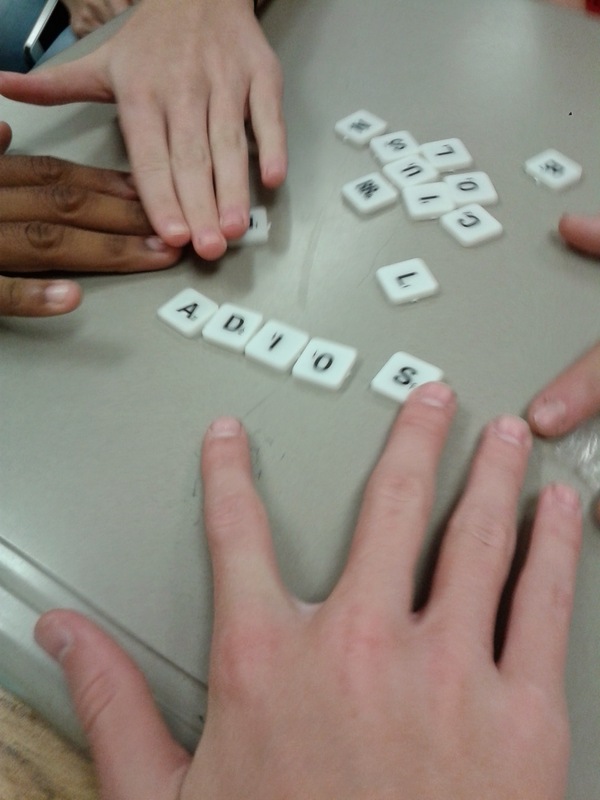 I divided the tiles into 4 baggies (about 25 tiles per bag – so multiple groups could participate at once), and asked students to first look at the tiles and review the alphabet (they need to be able to spell their name for their stamps). 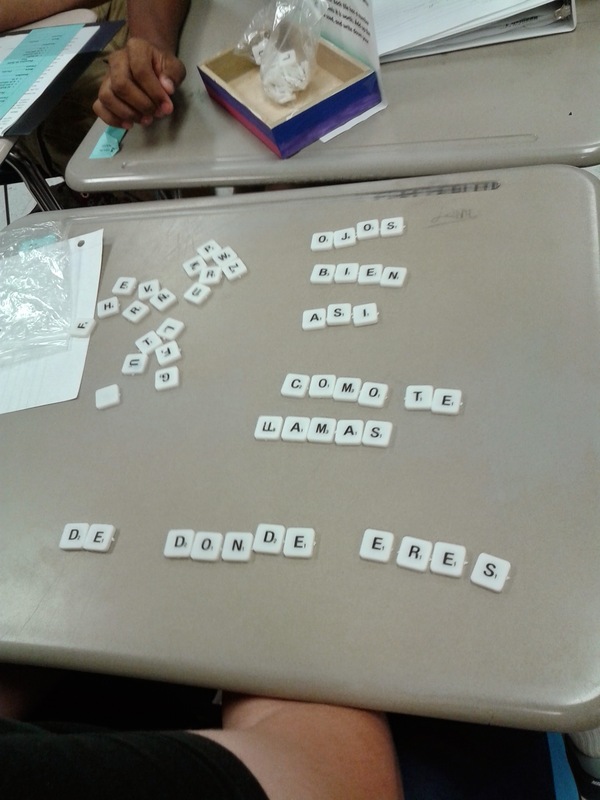 Then, they can arrange the letters into as many Spanish words as possible (they wrote them on their paper for accountability), and add up their points. They got really into this one! Also, isn’t it amazing how many words they know after just 2 weeks of class? 5. Tech stations: review vocabulary on Quizlet on smartphone, on my Promethean board, or on my desktop computer. They love the scatter game, and they can plug their headphones in and listen to the pronunciation. 6. Writing station: write a few sentences in Spanish about yourself telling your name, age, birthday, where you’re from, plus any bonus information you know how to say! I posted an example paragraph about myself on the board for extra reading input. 7. Stamps station: This is straight from the fabulous Jefferson County World Language Curriculum playbook. I gave them a set of speaking goals at the beginning of the unit, written as I can statements – I can introduce myself. I can ask someone their age. I can tell the date. As they learn how to do each goal, they do it for me out loud and I stamp their sheet. I LOVE the stamp sheets, but honestly, it’s difficult to balance listening to students individually while managing/teaching the other 31 students. Except on station day! I wrote up VERY CLEAR instructions for each station, posted around the room, and tried to be explicit about my expectations up front, so that students could manage their learning independently. If the rest of my students are occupied in learning tasks that don’t require my direct supervision, I’m free to focus on individual students, listen to their stamps, and give individual help and feedback. Differentiation success! The Creative Language Class has a pretty comprehensive series on stations (and have lots of other great ideas too! ), so if you’re just getting started I would recommend starting by reading through their posts. This entry was posted in Class Activities, Sp 1 Unit 1: Greetings/goodbyes/ numbers/calendar and tagged differentiation, greetings, numbers, Stations, Unit 1. Bookmark the permalink. 15 Responses to Stations: Practice and perfect! Thanks so much for this information! 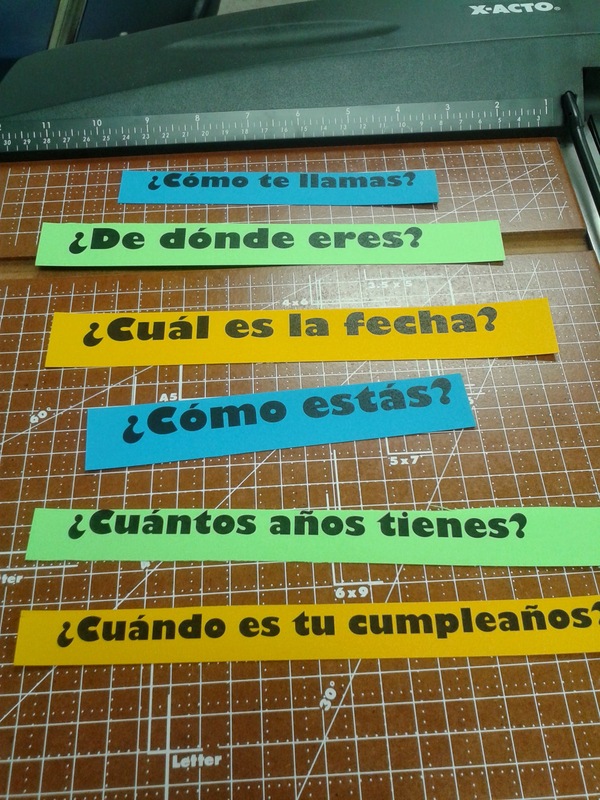 I’m planning to implement stations in my Spanish classes this year, and this is a huge help for me. 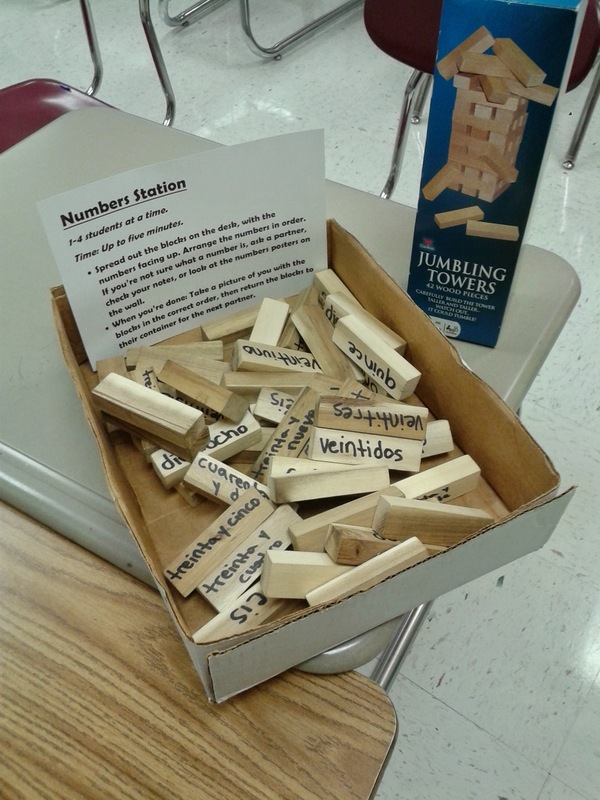 You just inspired me to change my plans for tomorrow, go out and buy jenga sets and use them to practice numbers. Thanks so much! Trafikskola Malmö I Hjärtat av Malmö City och Näset. med ett körkort? Mvh Dina vänner på E.T.City. bara någon minut från de flesta gymnasieskolor i malmö centrum och dig som jobbar i city. Excellent ideas. I have done stations too but rhe Hispanic speaking countries. Jusr similar to what you did. I have been setting up stations in my 6th grade classes and they love it! I am getting observed soon by a new supervisor and can’t wait to incorporate some of the suggestions you shared. These are great ideas. How often do the students gather at the stations? This is great! What do you mean stamp the students work. You actually have a stamp? You stamp students work? Is this like extra credit? Thank you for sharing. I’ve been toying with the idea of fully using stations in my classes so this has really given me even more of a push.